When we see photos of space, the data doesn't always come from one place. 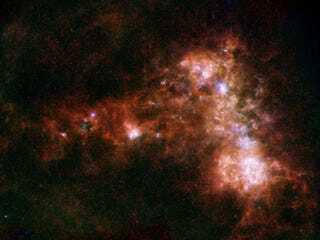 This photo of the Small Magellanic Cloud comes from the European Space Agency's Herschel's Spectral and Photometric Imaging Receiver (SPIRE), Photodetector Array Camera and Spectrometer (PACS), and NASA's Spitzer's Multiband Imaging Photometer (MIPS). The colours within this image provide information about the temperature of the dust mixed with the gas throughout the galaxy. The slight green tint stretching towards the left of the frame and the red hue of the main body of the galaxy are from the Herschel observations, which highlight cold material, down to a chilly –260 degrees Celsius . The brighter patches of blue were captured by Spitzer. These regions are made up of 'warmer' —about –150 degrees Celsius — gas and dust, and within some of these areas new stars are being born. These newborn stars in turn warm up their surroundings, resulting in intense clumps of heated gas and dust within the galaxy. These clumps show up brightly in this image, tracing the shape of the galaxy clearly — the SMC is made up of a central 'bar' of star formation, visible on the right hand side, and then a more extended 'wing', stretching out towards the left of the frame. Overall, the Small Magellanic Cloud is about 1/20th of the size of the Milky Way. It can be seen shining in the night sky of the southern hemisphere, and its brightest regions are easily visible to the naked eye. It is a satellite galaxy of our own — it orbits around the Milky Way along with its bigger companion, the Large Magellanic Cloud. These two galaxies have been extensively studied because of their proximity to us; astronomers can observe them relatively easily to explore how star formation and galactic evolution works in galaxies other than our own.